Crafting custom folding chair covers can be as simple as folding fabric and tying a knot – no sewing machine needed. Folding chair covers can be made with any fabric wide enough to wrap around the chair. Satin or organza fabrics create an elegant look for formal occasions. Cotton comes in a wide variety of colors and prints that can be elegant or playful. The wide ribbon used to secure the cover can match the fabric or be a contrasting color. Touches such as flowers, greenery or strands of beads can be added to the ribbon as well. Measure the chair from the top of the back to the floor and from the top of the front down, across the seat and to the floor to get the length of the fabric needed. Measure the chair across the back for the width. Cut the fabric in a rectangle 2 inches longer than the measurements and 2 feet wider. Fold the edges 1/2 an inch toward the wrong side of the fabric to create the hem. Pin in place and press with the iron. Remove the pins, fold 1/2 an inch toward the wrong side again and press. Folding the fabric twice keeps the raw edges tucked inside and prevents them from fraying. Place the fusible webbing between the folds and iron in place following the manufacturer’s heat settings or use fabric glue to secure the hem. Drape the fabric across the chair, centering the chair widthwise. The length of the fabric should go from the top of the floor in back, lying across the seat of the chair to the floor in front. Gather the fabric at the sides of the chair, partway down the back near the seat. Tie the edges of fabric at the back of the chair in a square knot. Tuck the ends of the knot neatly between the knot and the chair. Tie the ribbon around the chair with a bow at the back to secure the cover and hide the knot. Wide ribbon holds the folding chair cover in place better and makes it more secure than thin ribbon. Don’t make the covers so long that the ends trail on the floor. Trailing ends can get caught under the chair legs or stepped on when guests sit down or stand up. 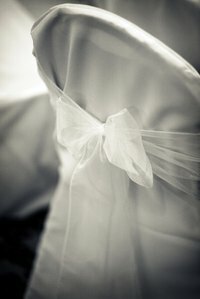 Cheap Wedding Solutions; Cheap Wedding Chair Covers, Make Your Own, Buy Or Hire?